Police investigating the deadliest terror attack to hit the UK in 12 years named the perpetrator Thursday as a 52-year-old British man, Khalid Masood. As the inquiry into the atrocity gathered pace, Prime Minister Theresa May revealed the attacker was once linked to violent extremism. He was thought to have been inspired by Islamist ideology, she said. 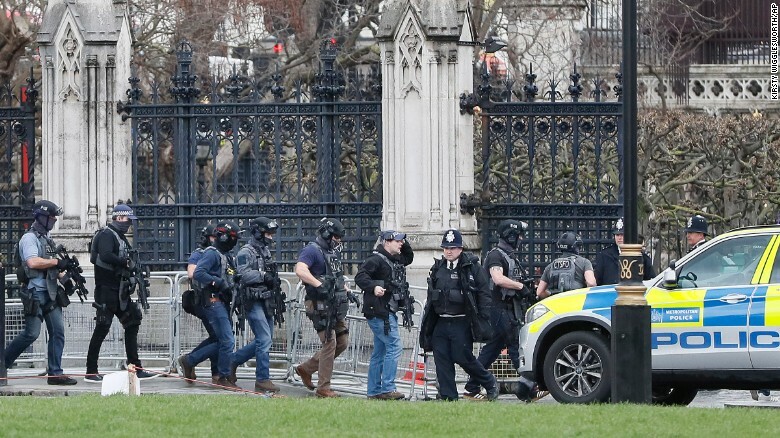 In an address to the House of Commons -- reconvened less than a day after it was placed in lockdown as the attack unfolded outside -- May vowed that Britain's freedoms and values would remain undiminished. Four people died in the attack. An American man and a British woman of Spanish origin were killed when Masood rammed a rental car onto the sidewalk on Westminster Bridge. Masood then stabbed an unarmed police officer in as he stood guard at Carriage Gates, an entrance into a cobbled courtyard frequently used by Members of Parliament and staff. A fourth victim died Thursday night after his life support was withdrawn at a hospital. An ISIS-affiliated news agency claimed that the extremist group was behind Wednesday's outrage, which left 29 people requiring hospital treatment. Six people remain critically ill. In a defiant speech, May vowed that Britain would not be cowed by the attack. "Yesterday an act of terrorism tried to silence our democracy. But today we meet as normal -- as generations have done before us, and as future generations will continue to do -- to deliver a simple message: we are not afraid. And our resolve will never waver in the face of terrorism. "And we meet here, in the oldest of all Parliaments, because we know that democracy -- and the values it entails -- will always prevail." She said the police officer who was killed in the attack, PC Keith Palmer, was "every inch a hero and his actions will never be forgotten." May said the current threat level for Britain -- which has been at severe, the second highest, for some time -- would not be raised to critical because there was no specific intelligence that an attack was imminent. Since 2013, police, security and intelligence agencies have successfully disrupted 13 separate terrorist plots in Britain, she said. "We know the threat from Islamist terrorism is very real. But while the public should remain utterly vigilant they should not -- and will not -- be cowed by this threat." A tweet from ISIS-affiliated news agency Amaq said the attacker was "a soldier" of ISIS, inspired by its message. However, ISIS has provided no evidence for any direct links to the assailant, whom it did not name. CNN Terrorism Analyst Paul Cruickshank said the language used by ISIS asserting the attack was by one of its "soldiers" did not necessarily mean the group was claiming direct connections to the attacker. This phrasing has been used in the past by the group for attacks ISIS believes it helped inspire, he said. Masood, who was born in Kent and had been living in the West Midlands region of central England, had previous convictions for violence but not for terrorism offenses, police said. His most recent conviction was in 2003 for possession of a knife. But he was not the subject of any recent investigations and there was no intelligence about his intent to mount an attack, the Metropolitan Police said. May said he was not part of the "current intelligence picture." "It is still our belief -- which continues to be borne out by our investigation -- that this attacker acted alone yesterday and was inspired by international terrorism," Rowley said. London Mayor Sadiq Khan told CNN that the city was protected by the best police and security services in the world. "I'm confident that we are doing all that we can to keep our city safe, to keep Londoners safe and to keep visitors safe," he said. Extra police officers will be patrolling London, he said.